The only thing we need is having Node.js and the NPM package manager installed (you might want to install ngrok, too but it is optional). 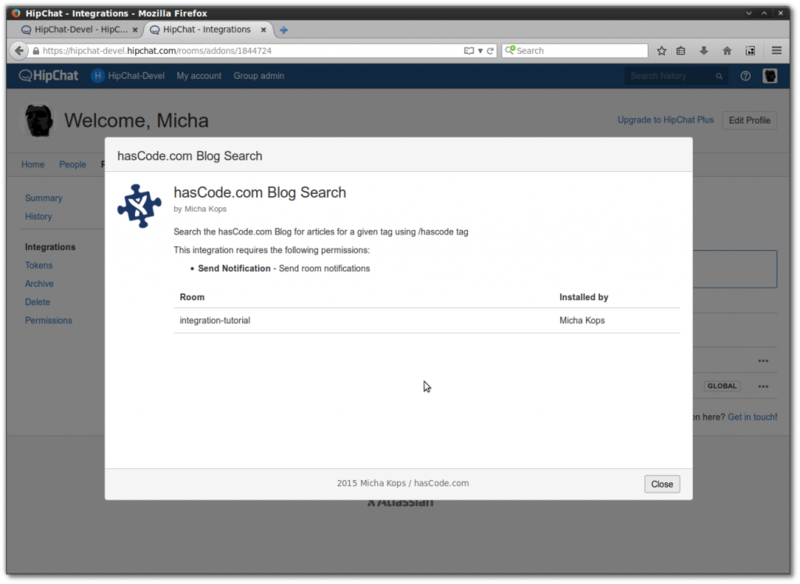 We’re going to build an integration for HipChat that allows us to search for blog articles from this blog, www.hascode.com by entering a command in the following syntax into a HipChat room where the integration is enabled: /hascode tag. Afterwards, a list of links to matching blog articles should be displayed in the room. If there are more then 10 search hits, a link to display all search results should be displayed rather than polluting the chat room with a long list of articles. 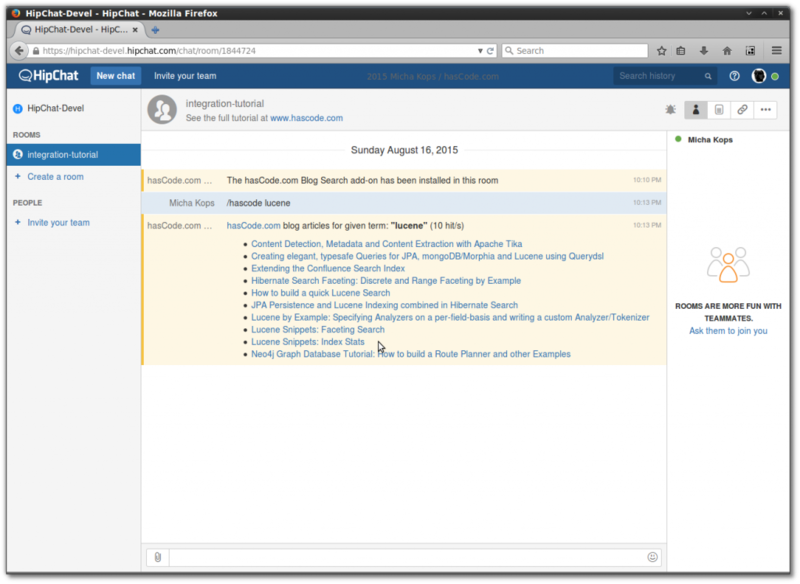 The screenshot above should give us a good impression of the interaction of the integration within HipChat. The following, hopefully not too confusing mind-map demonstrates the technology stack used to build the integration and to communicate with the chat server. 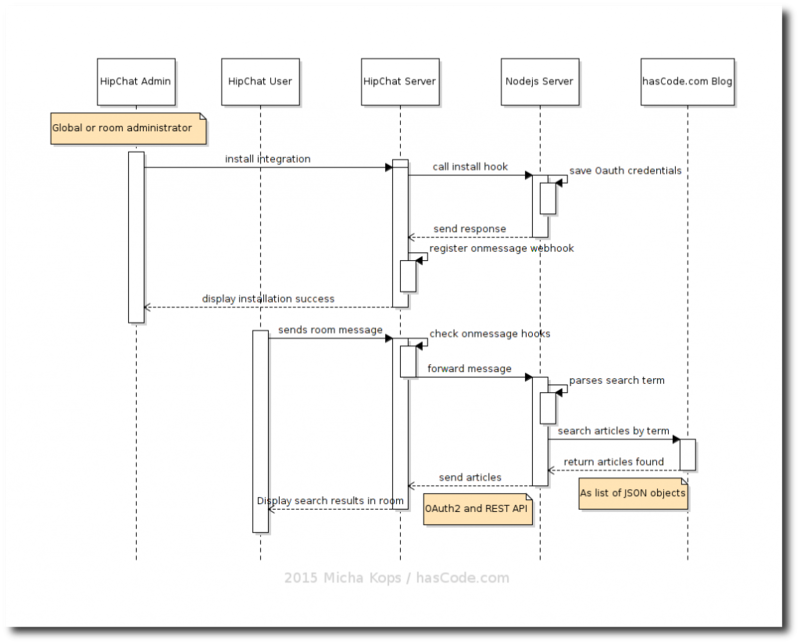 Technologies used for building a HipChat Integration. Integrations are not deployed within the HipChat server but must be run as a separate server instance. HipChat is only configured to call this remote instance on specific events, called web-hooks. That’s why our approach of building an integration is to create a server application with Nodejs and Express here. 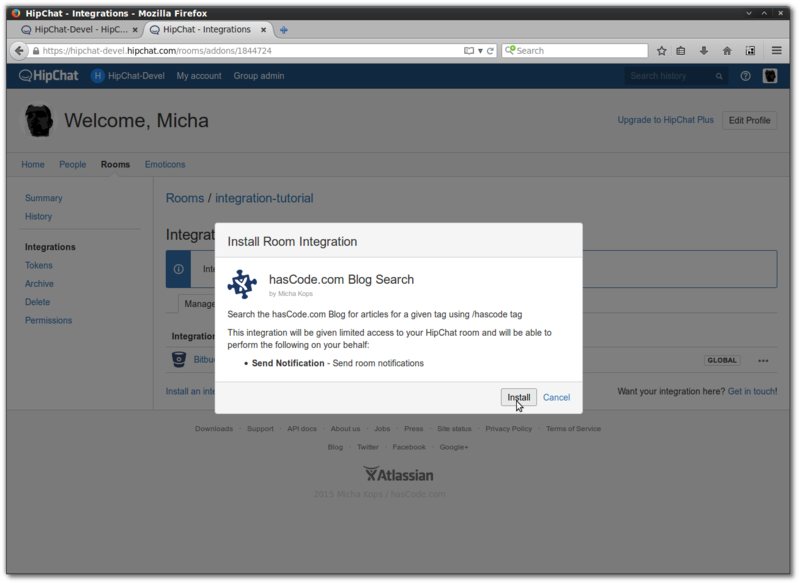 So what is happening when we install our integration to a HipChat room or run our blog article search? 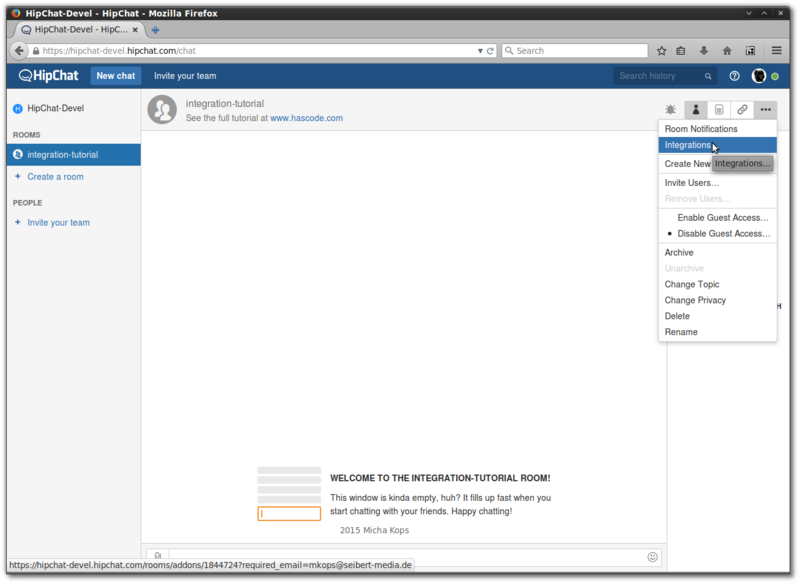 When the integration is installed into a room, HipChat reads the plug-in descriptor file and scans for web-hooks, permissions and install hooks. HipChat sends a request to our remote application with a specific JSON structure that contains important information like the OAuth2 credentials. Atlassian Connect Express is a toolkit that eases the process of creating Atlassian Connect addons for us providing utility and helper libraries to bootstrap new projects, configure Express.js based web applications and connect to an existing HipChat instance using Oauth2 and a REST client. 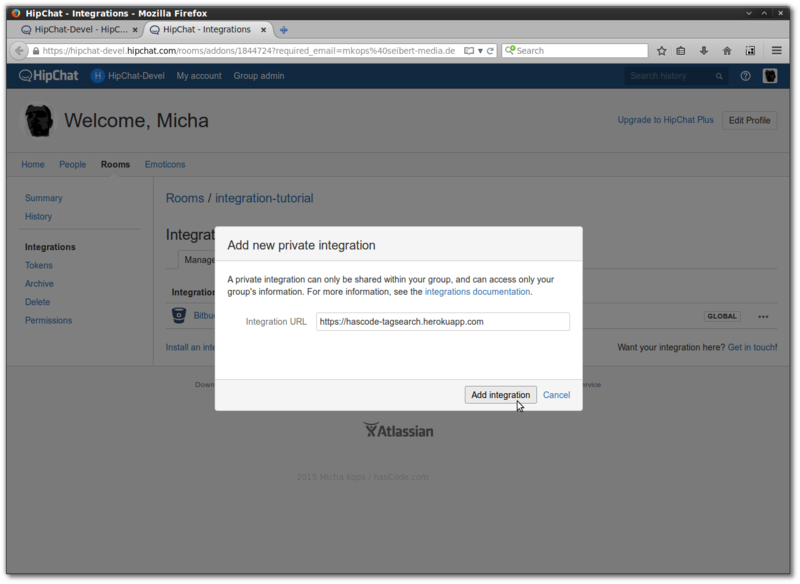 hipchat-integration-tutorial has been created. `cd hipchat-integration-tutorial` then run `npm install` to install all dependencies. Afterwards we have a full configured project and may take a first look at our application. We may remove the handlebar templates (*.hbs), addon.css and addon.js as we won’t need them in the following tutorial. When npm has finished downloading the internet, we can see that our dependencies have been saved in the node_modules directory. Now we’re entering the fun zone: implementing our application.. This is our config.json and it contains our configuration for the two stages development and production (explained in detail in the following chapter). The plug-in descriptor is used to install the integration into the HipChat instance and to display requested permissions and web-hooks to establish interaction between HipChat and our application. First of all we’re adding some description about our plug-in and its vendor by specifying name, description, vendor etc. hipchatApiConsumer we’re requesting concrete permissions that are granted to our integration upon install – for our plug-in all we need here is the permission to send notifications as we want to post the result of our blog search into the room. installable we’re specifying a callback URL that is called when someone installs our plug-in or removes it from a HipChat instance. Upon install we’re receiving the OAuth2 credentials and the clientId that we need to store to enable further communication between our application and the remote HipChat instance. webhook we’re specifying a callback URL (web-hook) that is called when a message is posted to a room that begins with “/hascode“. Just for the sake of completeness is this the generated app.js that bootstraps the web application, sets up stuff .. and luckily for us, we don’t need to change a single line of code here. This is our index.js that contains the core functionality of our application and the routes mapped to our web application. The imported hipchat client layer eases the communication with the remote HipChat instance and its RESTful webservices (and its authentication mechanism). When we receive a search event, we’re sending a new request to the blog search, we’re parsing the JSON response and generate a HTML list for display in the HipChat room. If the amount of search hits exceeds the given limit of 10, we’re displaying the first 10 search results and additionally display a link to view all search results on the blog. Ngrok is a nice tool that allows us to export our application running on localhost to the internet using a SSH tunnel. The only downside of the free version is, that we’re getting a random sub-domain assigned. During development, we don’t want to reboot our application every-time we’re changing the application logic. Luckily for us, there is nodemon to help us here: nodemon scans the project directory for file changes and reboots the application if changes were detected. Finally our application is ready for integration into a concrete HipChat instance. This is done within a few steps that I’d like to demonstrate here. We may add an integration for a room having sufficient permissions by clicking “Integrations” in the operation menu. We’re now entering the URL to the deployment descriptor exported by our application (I have used address of my Heroku app – more about Heroku configuration later..). HipChat loads the descriptor and displays the following confirmation with additional information about the plug-in vendor and required permissions. As we can see, the only permission we’re requesting is the permission to send room notifications. First of all we should be able to view the response from the on-install hook that confirms that the plug-in was successfully installed to this room. 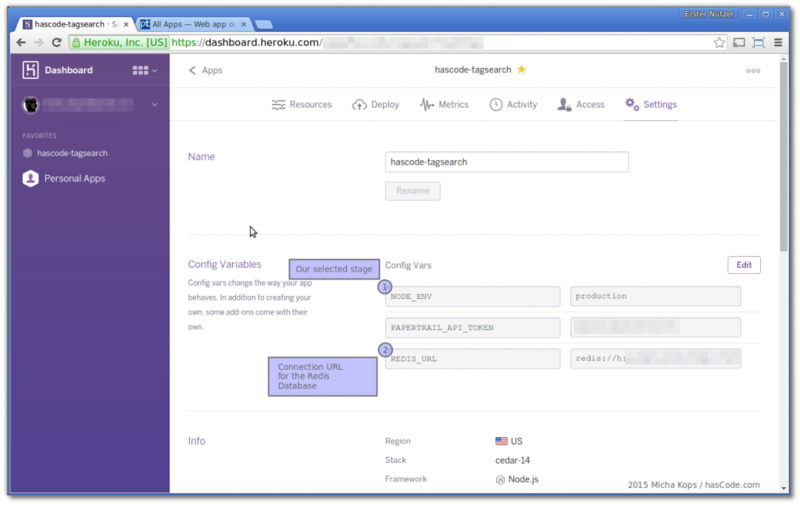 Our application is not bound for deployment and provision by a specific provider but to give a concrete example, I’d like to demonstrate the configuration and deployment for Heroku. 2015-07-30T08:40:10.208892+00:00 app[web.1]: ::ffff:10.181.95.28 - - [30/Jul/2015:08:40:10 +0000] "GET /atlassian-connect.json HTTP/1.1" 200 680 "-" "-"
2015-07-30T08:40:10.601568+00:00 app[web.1]: ::ffff:10.171.92.168 - - [30/Jul/2015:08:40:10 +0000] "POST /installable HTTP/1.1" 204 - "-" "-"
Another nice add-on to aggregate and visualize our logs is the Heroku Papertrails plugin – it’s limited but for free!